This Classic Manhattan Cocktail Drink Recipe is quick, easy and based on the original classic recipe. If you like whisky and vermouth, then this cocktail is for you. Rye is the traditional whiskey of choice, however commonly used whiskeys include Canadian whisky, blended whiskey, Tennessee whiskey or bourbon. The choice is up to you. 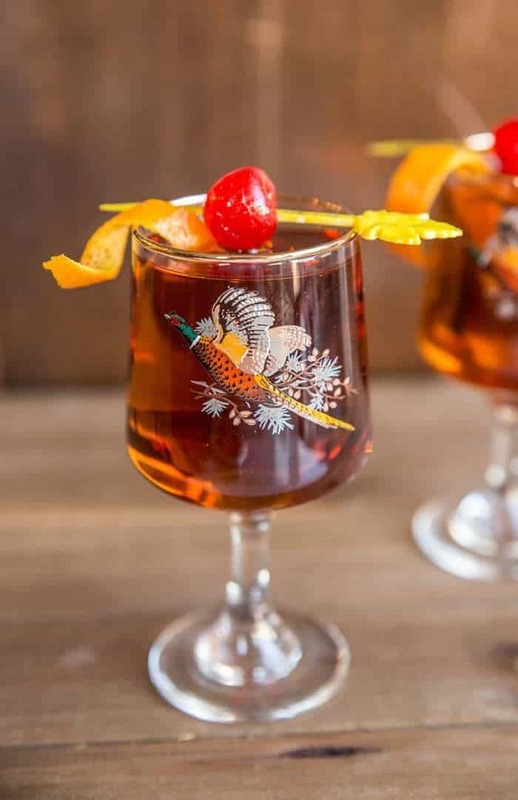 The Manhattan cocktail drink is another one of those drinks that has been around for many years (it’s thought to have originated in the 1870’s) and was again made popular by the popular TV series, Mad Men. As I mentioned in my Gin Gimlet Recipe post, Karlynn and I recently hosted a Mad Men themed party in our vintage home bar. Side note: You can get an inside look at how the room looks in Karlynn’s latest post: How to Throw a Mad Men Party. As part of this party, we created cocktail stations centered around popular characters from the show, Mad Men. This was one of the cocktails I made for the party and it was very popular. Here’s a look at the card I made; including the fun character profile; for the Joan Harris Classic Manhattan station. 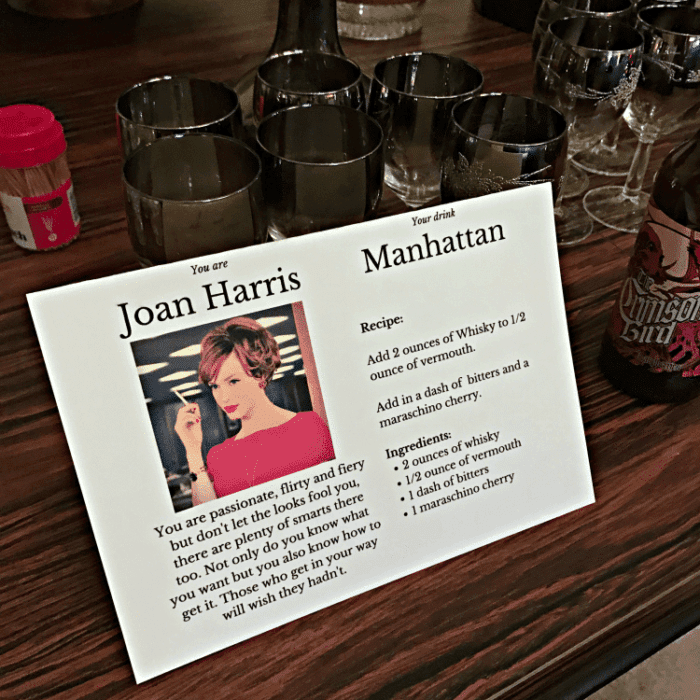 We didn’t use shakers as it would be too messy for our guests, so follow the instructions on the actual recipe card below for a true Manhattan drink. How do you make a Manhattan on the rocks? A non-traditional way to make a Manhattan drink is to make one on the rocks. Simply add your ingredients to a whisky glass, stir and then add ice. It will dilute the drink but some prefer it this way. What is the difference between a Manhattan and a Rob Roy? The Manhattan drink is made with rye whiskey ( whisky if it’s Canadian) and the Rob Roy cocktail is made with scotch. One of the staples of the Classic Manhattan cocktail drink recipe is, of course, an easy drinking whisky. Since the show focused heavily on Canadian Club as their whisky of choice, that’s what I based this particular Manhattan recipe off of. Canadian Club is a great choice for a few reasons; it’s quite inexpensive and it’s smooth enough that it mixes well (also makes a mean old fashioned). 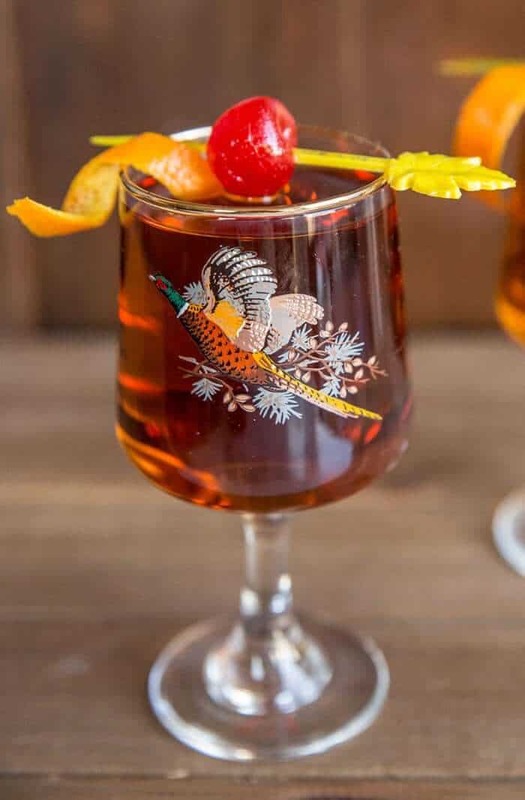 Side note: The glasses you see above are vintage pheasant glasses and are from our vintage barware collection. We actually have quite a few of these in various styles from the classic roly poly (commonly used for the old fashioned) to pilsner glasses. 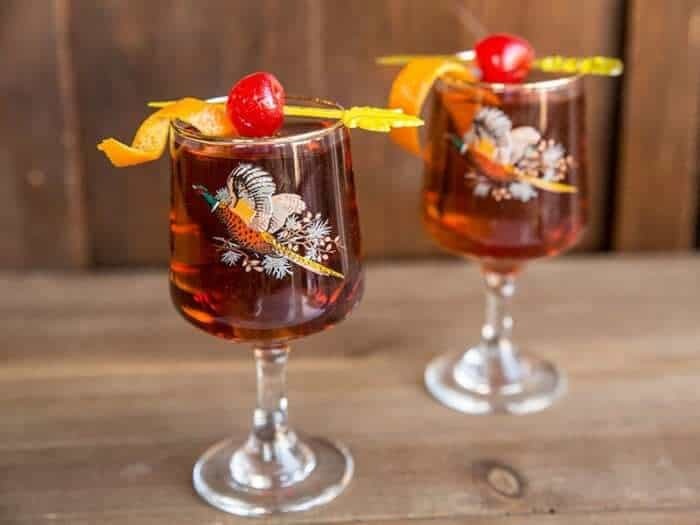 This is a strong drink meant primarily for sipping slowly (think port or similar) so use small sherry glasses similar to the above or a martini glass when serving. To prepare, add 2 oz Canadian Club whisky to 1/2 or 1 oz of vermouth. Add in a dash of bitters and 1 maraschino cherry. Give it a stir. Now turn on the fireplace, cozy up with your Classic Manhattan and enjoy! Why is it called a Manhattan? 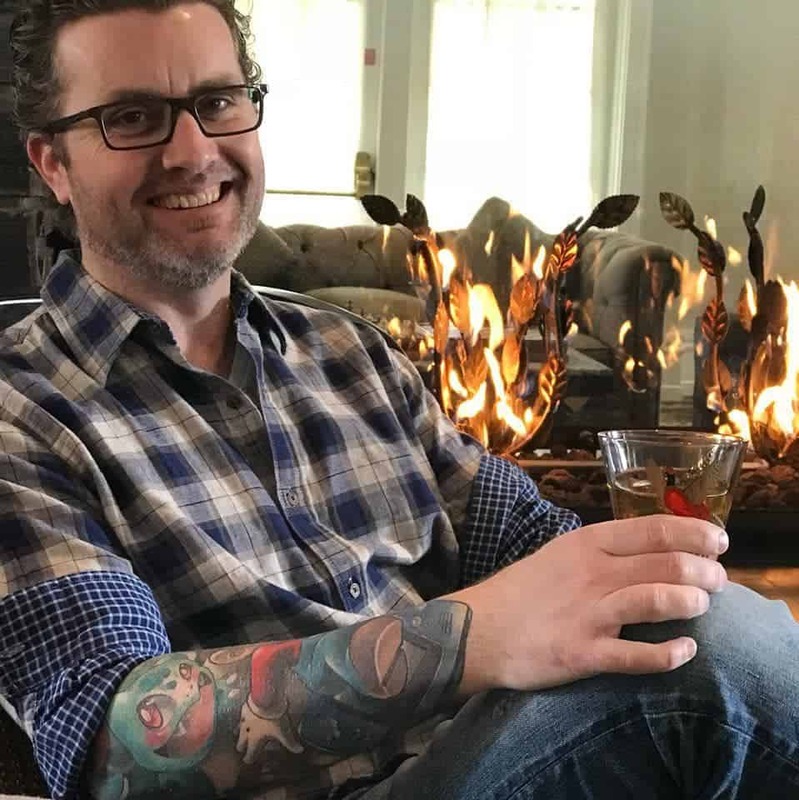 The two commonly accepted theories are that the creator was a bartender named Black at a bar on Broadway, which was also near Houston Street OR that it was invented at the Manhattan Club in the 1870’s. Basically, no one knows for sure but what is known is that the main reason it became popular to make it with Canadian Rye Whisky is that during the Prohibition years (1920–1933) Canadian whisky was available more than any other whiskey at the time. The close proximity to the Canadian border helped with smuggling rye over, I am sure! The video above shows you how to make a proper Manhattan. It’s one of Karlynn’s favourites to sip on in the winter ( she moves on to lighter summer drinks, you know, in the nicer weather, haha!) To see all of the other drinks and the write up on the Mad Men Party, click these links below! Pin this to your Cocktails Board and remember to FOLLOW ME ON PINTEREST for more great recipe ideas! Get the perfect Manhattan Cocktail Drink Recipe, this whisky and vermouth based, sweet drink is great for sipping. In a Boston shaker, place 3-4 ice cubes. Add 2 oz Canadian Club whisky to the shaker. Add 1/2 or 1 ounce of sweet vermouth to the shaker. Add 1-3 dashes of bitters to the mixture then place the shaker lid on top. Quickly shake the mixture ( make sure that lid is tightly closed!) until the shaker is extremely cold to the touch on the outside. Pour through the ice strainer top of the Boston shaker into a glass, traditionally a coupe but we use our small vintage pheasant glassware. Karlynn prefers a ratio of 2:1, with another 1/2 ounce of sweet Vermouth to dilute the pure rye whisky a bit more.